Large Blue Flower Garland 2...9 Feet of Gorgeous Flowers...Individual Diecut 3 piece Flowers and Leaves...Home Decor...Photo Prop...Swag! Celebrate... Floral and Travel Coffee card....Die Cut Coffee Cup Shaped Card...Tuck a gift card Note inside...Gorgeous Graphic 45 papers! Announcement Happy April! Let there be Flowers and butterflies....Spring are you here yet? This is Easter week, will the Easter Bunny come? Get ready for Mother's Day, Graduation, end of school parties and always birthdays! I am working on new items every day. This week I am featuring Mother's Day items in my windows. Need something special, convo me with your request. I have garlands for almost any occasion including Texas Tech garlands. Want a different school garland college or high school, convo me, I will make something special for you.! Thanks for shopping here today! Welcome to Sylvia's Corner, a place where you will find Unique Stamped Art, made in the USA. As an artist and designer I am devoted to making beautiful art, providing a large selection of items that you will want to keep but will share with your friends and family Visit my BLOG: http://www.syviastamps.typepad.com/ . ***All artwork is hand stamped using copyrighted property. The artwork is mine, the copyrights mine and the individual companies. You may not copy in any form any part of my artwork, no photocopies, no digital copies NO COPIES through manipulation of the artwork. Happy April! Let there be Flowers and butterflies....Spring are you here yet? This is Easter week, will the Easter Bunny come? Get ready for Mother's Day, Graduation, end of school parties and always birthdays! I am working on new items every day. This week I am featuring Mother's Day items in my windows. Need something special, convo me with your request. I have garlands for almost any occasion including Texas Tech garlands. Want a different school garland college or high school, convo me, I will make something special for you.! Thanks for shopping here today! Graphic 45 Holiday Cards...New Years Card...Layered Art Card...Birthday Card...Beautiful Designer Paper...Stampin'Up! snowflakes! Flamingo Birthday Card...Tropical Art Card A Beautiful Handstamped Card Layered Stamping Stampin'Up! Beauriful Butterfly Garland...Die Cut Butterflies...Watercolor Designer papers...4 sizes Butterflies...Floating Butterflies...Photo Prop! Poppy Garland Red...Home Decor...9 Feet of Gorgeous Poppy like Flowers...3 piece Flowers and Leaves...Home Decor...Photo Prop...Swag! 9+ Ft. Pink and White Butterfly Garland...Delicate die cut butterflies...Fluttering Garland...Beautiful designer papers and card stock! Beautiful Basket of Roses...Happy Birthday Bouquet...For a Friend...Hand Stamped...Water Colored ...Gorgeous Background...Stampin'Up! Gorgeous Tulip Tags..Beautiful Flower tags..Set 6 tags...watercolored tags...reverse side soft blue...blank...Work of Art background! 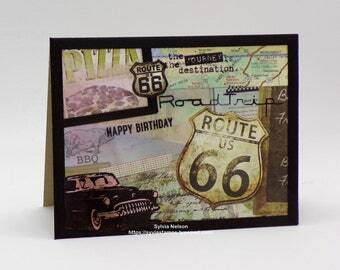 1950's Route 66 Car Coffee Card...Antique distressed card...Layered background real map...Coffee Break tag(TTuesday)...Tim Holtz stamps! Poppy Red Garland...Home Decor...9 Feet of Gorgeous Poppies...4 piece Flowers Hand Designed...Home Decor...Photo Prop...Swag! You just can’t fault having a hand-made note tag for your newest endeavor. These small tags will be given with small burlap bags filled with a collection of essential oils. I thought these would be perfect with Mother’s Day and Spring....I love the butterfly’s that are 3-D! 🌸🌺🦋This shop is my “always go to for unique and exactly what I need for a special occasions”. You just can’t fault having a hand-made note tag for your newest endeavor. These small tags will be given with small burlap bags filled with a collection of essential oils. Who doesn’t love the whimsicalness of a flamingo? I thought these would be perfect with my spring and summer bags. 💐This shop is my “always go to for unique and exactly what I need for a special occasions”. Water Color Art Tags...set of 6 Flamingo Tags...Stamped Art tags...Wedding Tags...Birthday tags...Beach Party tags...Stampin'Up! stamps! You just can’t fault having a hand-made note tag for your newest endeavor. These small tags will be given with small burlap bags filled with a collection of essential oils. I thought these would be perfect with Easter and Spring! 🐇This shop is my “always go to for unique and exactly what I need for a special occasions”. You just can’t fault having a hand-made note tag for your newest endeavor. These small tags will be given with small burlap bags filled with a collection of essential oils. I thought these would be perfect with Mother’s Day 🌹 This shop is my “always go to for unique and exactly what I need for a special occasions”. This cheery Mother's Day card is gorgeous, so many wonderful elements....a work of art. Beautiful Rose Mother's Day card....for your wife, mother, daughter. ..whomever you buy this for, they are sure to love it. This is a wonderful group of small envelopes that can be used for showers, weddings,scrap books, Journaling and more. Memories as a child, construction paper leaves and fall colors! Beautiful snowflakes glistening at your anniversary party or wedding event. Spring is here, add those floating butterflies to your home! Customer Lori, sent this photo of how she used four of my many shades of blue star garland. How lovely is this? It's a rainbow birthday party! Sylvia's Corner is a place to find unique cards, gifts and other paper creations. I have always been a crafter since I was little sitting at my grandmother's treadle sewing machine. I moved from sewing and beading doll clothes and presents like pincushions to fashion design when I was in college. I majored in art education, but after college and marriage, I designed and made costumes for a large dance studio in the city where we lived. I have lived all over the world and in many states. I opened my shop in 2008 while living in Colorado. Surrounded by beauty everyday, I had started making cards, instead of dolls and other crafts. With all these moves, my artwork changed with things I saw and experienced, making them so unique. I hand make everything myself. I am the artist, designer, blogger, marketer, customer service, packager! I make everything with love and care. I am an artist, crafter and world traveler. I have been creating cards for the last 8 years. My passion is water color and stamped art. but I love to paint. My unique cards take 3-5 hours to create, but I do it with love and great attention. Welcome to my shop. All merchandise are original designs by me and should be treated as such. I use only quality acid free products, 80 and 100lb card stock and beautiful designer papers. Browse at your leisure and thank you for your interest. Have a wonderful day! There are no refunds, however if there is a problem with your order, please convoy me so that maybe we can resolve the issue. PLEASE read descriptions including measurements carefully, so as to avoid disappointment over size. I only want you to be happy with your purchase! Convo me for a custom listing or order. Custom orders are non-refundable. If there are any questions or changes to your order contact me by convo at the beginning of the process, before I begin with your order. I will only begin once you have given your okay to the sample I send you. Any deposit will be returned minus any cost to me if you cancel, but you must contact me before I begin my production. Once you have given the okay, I will expect payment in full before I ship. I do appreciate your business and thank you for considering my items. Payments may be made through Direct Checkout or through Pay Pal, whichever is convenient for you. However, payment must be received when you place your order. All single card orders are shipped in a white envelope with cardboard reinforcement. Price for one is $3.25. This does not apply to stamp pads which have calculated shipping with a handling fee. All shipping orders are shipped USPS First Class mail to the address provided by you on Etsy. Please make sure your address is correct. As of August 20th 2018, If the USPS does not recognize your address, I will cancel your order and charge you a cancellation fee. Each package is hand delivered to the post office. You may ask for a shipping upgrade if you wish insurance, ship insurance is 80 cents. Once delivered to the post office it is out of my hands. If you have not received your package within 3-5 business days please notify me. If tracking shows it has been delivered, start with your neighbors, then check with your carrier and then your post office. Unfortunately there is not much I can do once it has posted delivered. If returned to me due to a wrong address, you may supply me with additional postage to mail it back to you. No returns available. International shipping takes 7-10 days, there is no insurance for overseas countries and there is no assurance on my part that your package will arrive once in the hands of the Post Office. If you wish quicker shipping than first class mail, it is available at your cost. Prices have gone up to overseas locations. Money for overage of overseas postage will be refunded immediately upon printing of your postage. If you want your item mailed at the post office that can be done on Saturdays only and I will refund your shipping accordingly. There will still be a $2.00 on these international items, that will cover the cost of the gas and materials to mail your item. We can not be responsible for lost or damaged products shipped by USPS. If damaged and this item is insured, contact me for instructions on how to collect on damage. All custom orders must be paid for in advance. I am not able to start the order without payment. There are no refunds on custom orders that have been finalized, paid for and shipped. Work with me to get all your information on want you need and want before the invoice is sent. Once it is sent any changes could result in extra fees if the order has already been started. My goal is to make you happy so that your event is a joyous occasion. ***All artwork is hand stamped using copyrighted property. The artwork is mine, the copyrights mine and the individual companies. You may not copy in any form any part of my artwork, no photocopies, no digital copies NO COPIES through manipulation of the artwork. If you use this artwork in something you make, you must give credit to all companies and myself for this artwork. To fulfill your order, you must provide me with certain information (which you authorized Etsy to provide to me), such as your name, email address, postal address, payment information, and the details of the product that you’re ordering. You may also choose to provide me with additional personal information (for a custom order or your phone number which is a required field for fast shipping, for example), if you contact me directly. - For purposes of EU data protection law, I, Sylvia Nelson, am the data controller of your personal information. If you have any questions or concerns, you may contact me at sylviadnelson [!at] gmail.com .